March 27, 2018 — Today we finish our look at the new Pennsylvania filings from Districts 10 thru 18, but first must mention a new story floating in the Washington Post and throughout the local Philadelphia media. Rep. Ryan Costello (R-West Chester), after filing for re-election, is already dropping out of the race. In withdrawing, the two-term incumbent virtually hands the seat to Democrat Chrissy Houlahan, a first-time candidate for any office, because the local Republican Party will have no way of replacing him. Attorney Greg McCauley filed in the Republican primary and becomes the party nominee now that Costello has backed away. It is unclear why Costello filed for re-election if he was not serious about running. Though new District 10, that now includes all of the York and Harrisburg metro areas, is more Democratic than Perry’s previous 4th District, President Trump still posted a nine percentage point win during the 2016 presidential election contest. Rep. Perry is unopposed in the Republican primary and draws five Democratic opponents, including 2016 congressional nominee Christina Hartman who suffered a decided loss to freshman Rep. Lloyd Smucker (R-Lancaster) in an adjoining district. Hartman raised over $1.1 million for her first congressional effort, and was originally seeking a re-match with Rep. Smucker. When the new redistricting plan left him with a solidly Republican district, she moved here even though none of her previous territory transferred to new CD-10. March 19, 2018 — Though Tuesday’s special election results in western Pennsylvania are not yet even finalized, the two candidates, and others, are making decisions about where to run in the regular election cycle. After the state Supreme Court created a new congressional map for the coming election, they lengthened the candidate filing period from one that closed March 6 to a new deadline of tomorrow, Tuesday, March 20. Republicans are formally challenging the new map in federal court. A three-judge federal panel has already heard their arguments and the GOP leaders also filed a motion to stay the state court’s mapping decision with the US Supreme Court. Since no ruling has yet come from either judicial panel, incumbents and candidates must move forward with the qualifying process assuming the new map will stand. Under Pennsylvania election law, congressional candidates must obtain 1,000 valid signatures from registered party members to qualify for the ballot. Since such a process obviously requires time, all candidates, including Rep.-Elect Conor Lamb (D-Pittsburgh) and defeated Republican candidate Rick Saccone, must determine where they will run under this new and very different Keystone State congressional map. 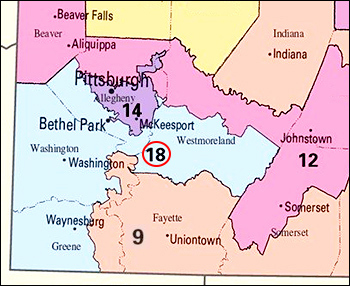 Pennsylvania’s current 18th District, in the southwest corner of the state. March 15, 2018 — Democrat Conor Lamb appears to have captured the 18th District special election held Tuesday in southwestern Pennsylvania, besting Republican state Rep. Rick Saccone (R-Canonsburg); but it will likely be a couple days before the result is finalized. The margin stands at 641 votes in Lamb’s favor of 228,177 ballots cast with all precincts reporting and absentee votes counted, meaning a recount could be ordered. Democrats will claim that this special election result sets the groundwork for the “blue wave” they have been predicting because their candidate converted a district that President Trump carried by 20 points and where resigned Rep. Tim Murphy (R-Pittsburgh) didn’t even draw an opponent during the past two elections. Republicans will now counter saying that Lamb didn’t run like a liberal Democrat but was able to bring the large conservative western PA Democratic voter contingent — those who came out in droves to support President Trump, for example — back into his party’s column. During the campaign, Lamb publicly indicated that he would not support Minority Leader Nancy Pelosi (D-CA) as a way to convince the behaviorally conservative regional voter that he is not a national Democrat. Additionally, Lamb’s deep family ties to the Democratic base helped him as well. His grandfather is a former state House majority leader, and his uncle is the Pittsburgh City controller. President Trump will undoubtedly take some credit for the close outcome. Prior to his visit to the district, pollsters were showing a much larger lead for Lamb than the preliminary final outcome produced. The final Monmouth University poll, for example, predicted a six to seven-point Lamb lead if the Democrats “surged” in turnout as they have done in other special elections around the country. March 14, 2018 — The Keystone State special congressional election was held yesterday, as southwestern Pennsylvania voters went to the polls to choose a replacement for resigned Rep. Tim Murphy (R-Pittsburgh). Before PA-18 Election Day, Democrats appeared to have the better candidate in the person of attorney Conor Lamb, whose grandfather was a former state House Democratic leader and uncle is the Pittsburgh City Controller. Simultaneously, this election carried major national ramifications, yet the winner’s success might be short-lived, when one can be identified, which likely will take a day or two longer. With 100 percent of the vote in, Lamb leads Republican state Rep. Rick Saccone (R-Canonsburg) 113,111 (49.8 percent) to 112,532 (49.6 percent) a difference of only 579 votes as of this writing. Absentee and provisional ballots are still being counted. So there’s a chance that Saccone could overtake Lamb, however, that’s unlikely. Democrats predicted victory before yesterday’s election, citing polls showing Lamb holding a slight lead over Saccone. 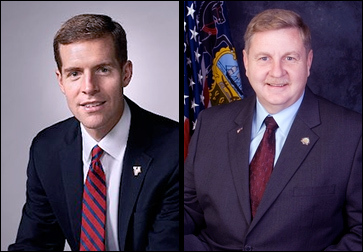 The last survey, coming from Monmouth University (March 8-11; 372 likely PA-18 voters), gave Lamb leads of two to seven points, depending upon the overlaid turnout model. Obviously, the more energized and aggressive Democratic participation model gave Lamb the stronger edge. Under a low turnout model, the lead dropped to two points. Pennsylvania is one of 13 states that has no early voting system, so there were no tangible pre-election turnout indicators for this contest. The Lamb campaign approached $5 million in dollars raised for the race versus Saccone directly commanding resources in the $1 million range. The national Republican Party organizations and conservative groups entered the district to even the spending, so it’s likely we’ll see total combined expenditures approach or exceed the $15 million mark.